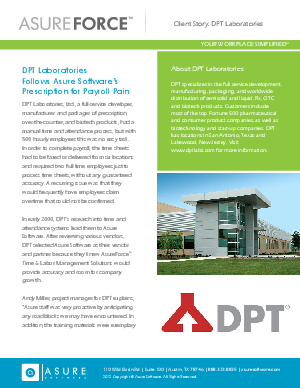 DPT Laboratories, Ltd., a full-ervice developer, manufacturer and packager of pressciprtion, over-the-counter, and biotech products, had a manual time and attendance process, but with 500 hourly employees this was no easy task. In order to complete payroll, the time sheets had to be faxed or deliverd from six locations and required two full time employees just to process time sheets, without any guaranteed accuracy. As a result -- employees would frequently claim overtime that could not be confirmed.